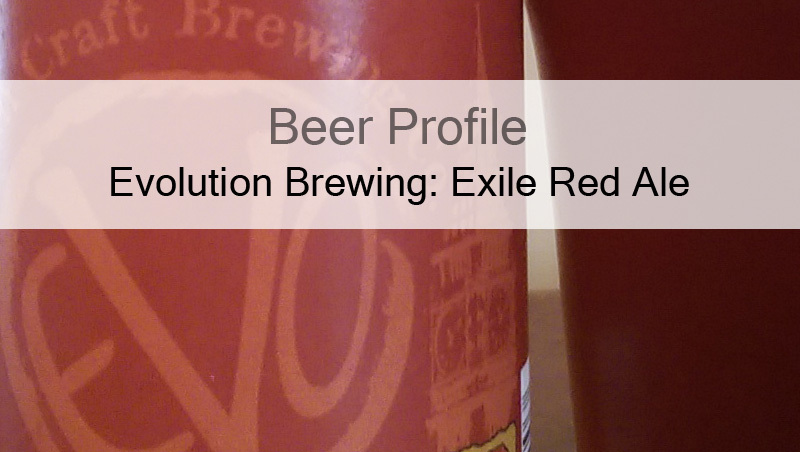 Beer Profile: Evolution Brewing Exile Red Ale – Food. Beer. Stuff. I will drink Exile Red Ale until I am blue in the face. Does that make sense? Today I get to profile a some-what local to my area beer, Evolution Craft Brewing Company Exile Red Ale. Coming straight out of Salisbury, MD Evolution Brewing has been making some great beers in the Delmar area since 2009. 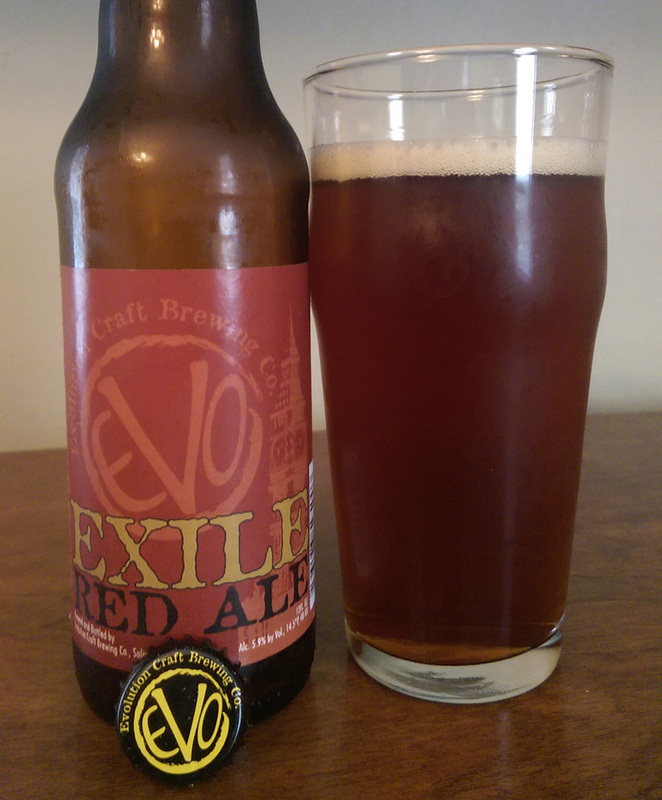 Brewed By: Evolution Craft Brewing Co.
Exile Red Ale comes in the familiar brown bottle with an attractive if subtle label. One thing I like is that they put the IBU and Degrees Plato on the label right along with the ABV, something I really wish I saw more of. Not just because it makes my job easier but I feel like the more info we have about a potential beer buy the better. Exile Red Ale pours a nice deep brown that shows a redder hue in the light. With an easy two finger head, pour lightly down the side with this slightly above average carbonated beer. Aromas are a mix of caramel malt sweetness with a bit of cascade hops giving this a very familiar “American Beer” scent despite the English Beer inspiration. Better off dead than red on the head. On first sip, I find this beer to be quite a bit more hoppy than expected. A nice surprise for me but might not be so welcome to those who live and die off the heavy presence of caramel malts. The sweetness is there so don’t despair but that balance seems a bit skewed towards the hop side of the equation. I find myself enjoying this red ale quite a bit. Medium in body and mouth-feel, the slightly higher than to style carbonation was a good decision on their part leaving Exile Red Ale with a nice crisp finish. Exile is going down easy with a rewarding complex flavor that dances on the tongue as the many bubbles release their CO2 in my mouth. Not much lacing going on, if that’s your thing. As I pour the last few sips through my gullet, I find it hard not to notice the glass hardly appears to have ever had beer in it at all. 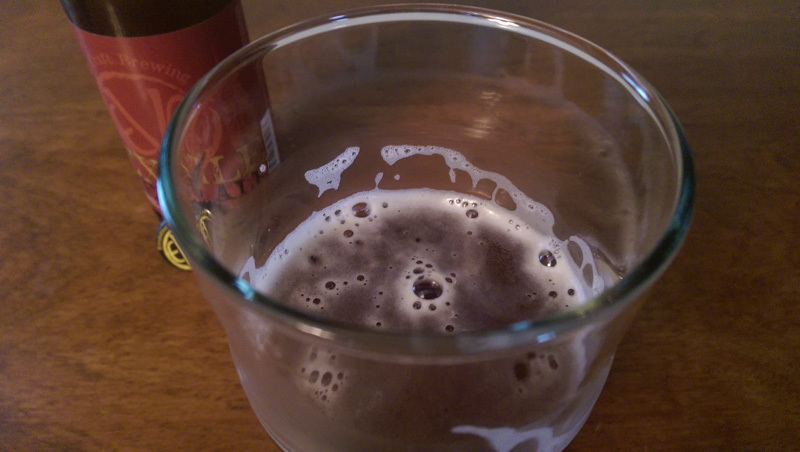 People have different opinions on the presence of glass lacing and if that is proof of a well crafted beer or not. I tend to fall into the “it doesn’t matter but it’s nice to see” camp. This was a tasty red ale from Evolution Brewing. Highly drinkable, with a great balance I found Exile to be a great example of the style with just enough sweetness to know what your drinking without the teeth pain I find with some other red ales on the market. All in all a great beer worthy of your dollars. Though a bit off style perhaps with the Cascade dry hopping, I really felt like this adds nicely to the beer without taking anything away from it for red ale lovers. Have you had the chance to try out Evolution Exile Red Ale? What did you think about it?